The 2018 Ford Fusion Hybrid has a great story to tell. For car buyers who want a fuel-efficient hybrid car, but don’t want to give up interior space or look like they are driving a car that labels them, the Ford Fusion Hybrid checks all the boxes. What’s the first thing that pops into your head when you hear the words “hybrid cars?” It is probably “Prius.” But did you know that for just a little more than the compact Prius, you could have a much larger, technology-packed mid-size 2018 Ford Fusion Hybrid? It’s true! You get all the great fuel-saving qualities of a hybrid system, but in a car that has room for the whole family and all their stuff. The 2018 Ford Fusion Hybrid continues with no changes from the 2017 model. 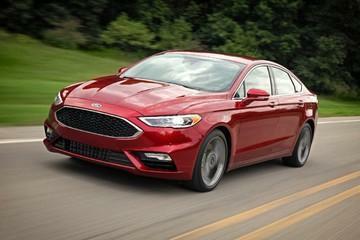 Items that were new for 2017 carry over to the 2018 Fusion. The 2018 Ford Fusion Hybrid is available in four different trim levels: S, SE, Titanium, and Platinum. Standard equipment on every 2018 Ford Fusion Hybrid is very extensive. Inside, you get an automatic transmission, anti-lock brakes, split 60/40 fold-down seat back, air conditioning with particulate air filter, SYNC infotainment system, rotary gear shift dial, front center console with armrest, speed-sensitive wipers, hill start assist, illuminated sun visors, two 12V power points, message center with trip computer, tilt/telescoping steering wheel with cruise and audio controls, push button start with keyless entry, and MyKey. Outside, there are aluminum alloy wheels, a capless fuel filler, integrated blind spot side mirrors, LED taillamps, and solar tinted glass, all standard on the 2018 Ford Fusion Hybrid. The 2018 Fusion Hybrid is powered by a 141-horsepower, 2.0L iVCT Atkinson-cycle four-cylinder engine, combined with an 88kw electric motor. This produces a total of 188 combined system horsepower. An electronic continuously variable automatic transmission drives the front wheels. A 1.4 kWh lithium-ion battery powers the electric motor, and is partially recharged by the regenerative anti-lock braking system. The Hybrid gets 5.5 L/100km City and 5.7 L/100km Highway. * That’s excellent for a mid-size car! The 2018 Ford Fusion Hybrid comes standard with dual stage front driver and passenger airbags, front-seat side airbags, side curtain airbags, driver and front passenger knee airbag, and seat belt pretensioners. A rear view camera lets you see what’s behind you, and the individual tire pressure monitoring system alerts you when a tire gets low. You also get Advancetrac with electronic stability control, and SOS post-crash alert. Looking for a fuel-efficient hybrid car that skimps on fuel, but still has room for everyone? Then check out the 2018 Ford Fusion Hybrid at Van Isle Ford in Port Alberni. Contact us today for a very economical test drive of this great looking hybrid car! *Based on 2017 EnerGuide fuel consumption ratings. Government of Canada test methods used. Your actual fuel consumption will vary based on driving habits and other factors. Use for comparison purposes only. Ask your retailer for EnerGuide information.